Colorful Seasons Garden Center is celebrating its 30th year of year-round business serving Alexandria and surrounding communities. Our team strives to bring the best quality of products and services to our customers in all phases of our business, from our home-grown annuals, vegetables and herbs to our top-notch landscape design and installation department, as well as our trendsetting home decor, gift and garden accents. At Colorful Seasons we are constantly expanding our selection of product lines and our overall knowledge of the ever-changing industry, all in an effort to assist and better serve our valued customers. From Home Decor and Girlfriend gifts, to many unique and fun items for your home or office... photo frames, fragrant candles, clocks, framed prints, and so much more! Plus, pretty scarves and jewelry! Colorful Seasons has many unique, one-of-a-kind home décor and accent pieces, which are great for yourself or as a gift. Also available are a vast selection of statuary, fountains, cast iron urns, pottery, trellises and arbors on our outdoor patio. The Greenhouse changes seasonally. During the spring-summer, the greenhouse is filled with a colorful array of bedding plant materials. We strive to offer the newest varieties and provide exceptional quality while offering an excellent selection of annuals, vegetables, herbs, blooming plants, houseplants, hanging baskets and succulents! Find the highest quality perennials, trees, evergreens, fruits, vines, roses and shrubs to bring your yard and garden to life! You will find plants you simply can't find elsewhere and a staff that will answer your questions and get you growing! Whether you're building new or re-landscaping, Colorful Seasons Garden Center can create the perfect outdoor environment, we take into consideration your wants, hopes, and needs for the project and then create a plan suited for you and your home or business. Colorful Seasons landscape services consists of experienced, knowledgeable team members that can assist and customize your landscape and living space needs, from pavers, retaining walls, steps, night lighting, water features, irrigation systems and hydroseeding to plant installation. We grow some of the finest plants in the Alexandria area, which may be enjoyed in your home, business and landscape. 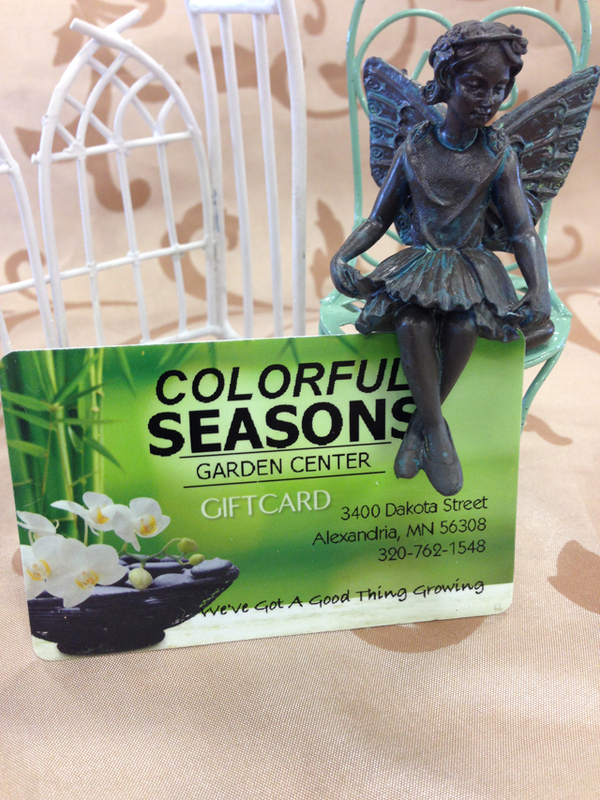 There are so many reasons to shop Colorful Seasons Garden Center! If you love nature as much as we do, then you'll love Colorful Seasons Garden Center.